Tunisian police have fired tear gas to disperse violent protests in Sidi Bouzid, the cradle of the country’s Arab Spring and the hometown of assassinated opposition leader Mohammed Brahmi, Reuters reported, citing witnesses. Angry demonstrators threw rocks at police, the news agency quoted local resident Mahdi al-Horshani as saying. "Hundreds of protesters lit tires on fire to block roads and they threw rocks at the police," he said. "There is a lot of anger and frustration at the situation." 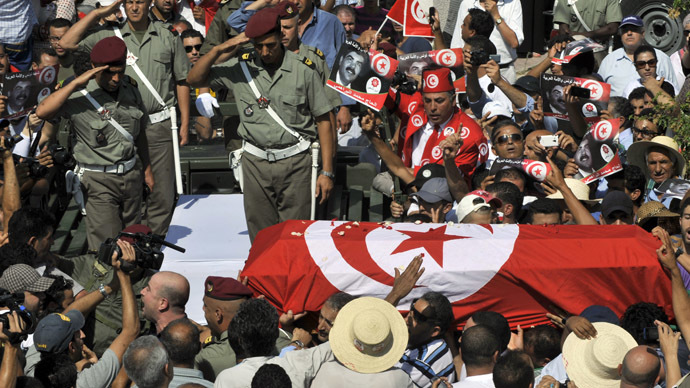 Earlier in the day, Tunisian police teargassed crowds people as tens of thousands of citizens turned out for the funeral of politician Mohamed Brahmi, calling for the Islamist-led government to be toppled. 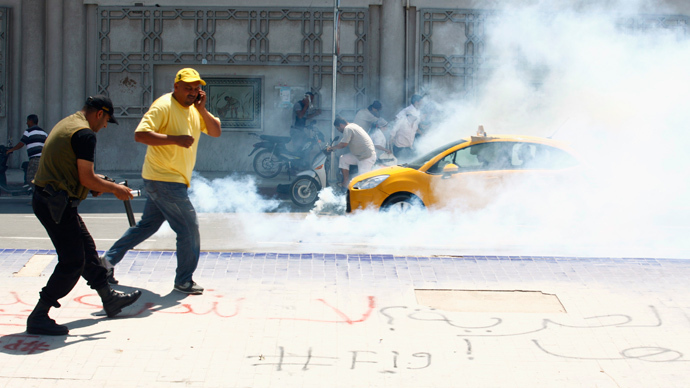 Shortly after the funeral, supporters and opponents of Ennahda clashed outside Tunisia's National Constituent Assembly, as security forces fired tear gas to disperse demonstrators. Meanwhile, secular coalition partners of Tunisia's ruling Islamist party said they are amid negotiations to reach a new power-sharing deal in a bid to end violent protests. "The trend now is to move towards expanding the base of power," National Constituent Assembly spokesperson Mufdi al-Masady said. President of the Constituent Assembly, Mustafa Ben Jaafar, has called on lawmakers who withdrew from the 217-member body in protest to return to work in order to complete the constitution. "I call on them to back down from their decision. It's not rational to throw in the towel just meters away from the finish line," he said in a televised statement. "The constitution will be agreed on in August and the assembly will finish its work on October 23." Opposition leader Brahmi was murdered by gunmen on Thursday triggering protests and accusations of government complicity. The 58-year-old politician is believed to have been gunned down outside his home by two men on a motorcycle. The suspects reportedly used the same gun that assassinated left-wing politician Chokri Belaid in February, Tunisia’s interior ministry said. Some 14 Salafists have been identified and are suspected of involvement in Belaid's assassination. Most of them are believed to be members of the local hardline Islamist group Ansar al-Sharia, Tunisia’s interior ministry said. The group has denied any role in the murder. "Ansar al-Sharia has no links to this political assassination that was done as part of a known effort whose goal is to drag the country into chaos," it said.